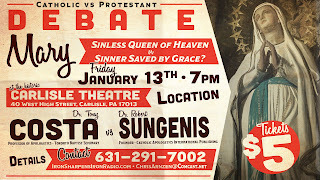 Answering Muslims: Upcoming Debate: Was Mary a Sinner Saved by Grace or the Sinless Queen of Heaven? Parallels with Islam? 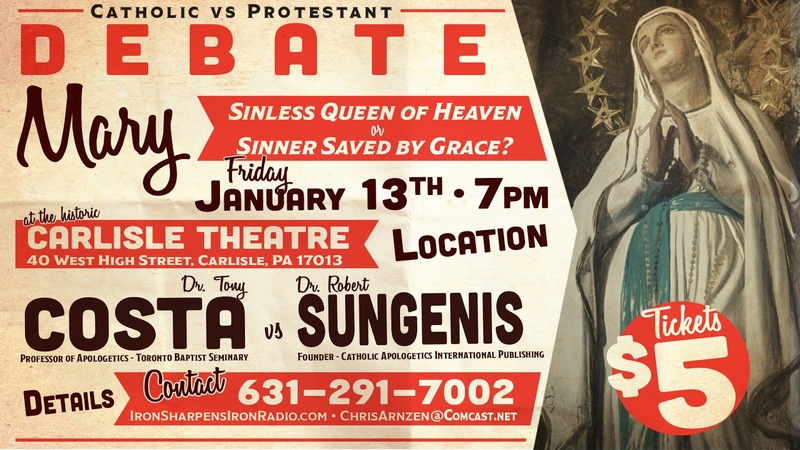 Upcoming Debate: Was Mary a Sinner Saved by Grace or the Sinless Queen of Heaven? Parallels with Islam? “Abu Huraira said, ‘I heard Allah’s Apostle saying, ‘There is none born among the offspring of Adam, but Satan touches it. A child therefore, cries loudly at the time of birth because of the touch of Satan, EXCEPT MARY AND HER CHILD.’” (Sahih Al-Bukhari, Volume 4, Book 55, Number 641; see also Volume 4, Book 54, Number 506). “Abu Huraira reported Allah’s Messenger (may peace be upon him) as saying: No child is born but he is pricked by the satan and he begins to weep because of the pricking of the satan EXCEPT THE SON OF MARY AND HIS MOTHER…The newborn child is touched by the satan (when he comes in the world) and he starts crying because of the touch of satan.” (Sahih Muslim, Book 030, Number 5837). Abu Huraira reported Allah’s Messenger (may peace be upon him) as saying: The satan touches every son of Adam on the day when his mother gives birth to him WITH THE EXCEPTION OF MARY AND HER SON. (Sahih Muslim, Book 030, Number 5838; see also Book 033, Number 6429). If Jesus was not touched by Satan when he was born, and he was blessed and sinless, and Mary was not touched by Satan when she was born, this would seem to imply that Mary was also blessed and sinless. This of course is not what the Bible teaches. All have sinned and come short of God's glory (Romans 3:23), including Mary. Mary recognized her need for a Savior when she exclaimed, "My soul magnifies the Lord, and my spirit rejoices in God my Savior" (Luke 1:46-47). Sinners need a Savior. That is why Jesus came, to seek and save the lost. Trying to disqualify catholicism on the basis of this "parallel with islam" is a low blow. More likely those hadiths are just echoing what muslims got from the christians of the time. The idea of the sinlessness of Mary was affirmed by many Church fathers, after all. You will be debating one of the most feared and knowledgeable Catholic apologists (just one look at purgatory debate gives you a good idea, where Sungenis trapped James White in the corner so much that White on camera said there are other judgments besides the final judgement, because he had no other choice but to say it in order to save his theology). Laura, many Church Fathers also rejected the sinlessness of Mary like Augustine. The point is not what the Church Fathers believed, it is what does the Bible teach? Scripture is infallible, the Church Fathers were not. The sinlessness of Mary is an unbiblical doctrine. It's Clear That The Roman Catholic Church Teachings Is Not Align With The Word Of God In The Holy Bible! Here's a Proof that Mary was a Sinner, Needed a Savior, had More than Five children, and is Not "Mediatrix"
Firstly, all men have sinned, including Mary, and fallen short of the glory of God [Rom 3:23], and through one man sin entered the world and death spread to all men [Rom 5:12]. King David writing in Psalms says that he was brought forth in iniquity and in sin when his mother conceived him - biblical proof of mankinds sinful nature from the time of conception. [Psalm 51:5]. According to the law of Moses every mother that conceived, either a male or female, had to after an appointed time offer sacrifices to God: one as a burnt offering, and one as a sin offering [Lev.12]. Mary, after conceiving Jesus made these sacrifices in accordance and obedience to the Law God gave to Moses. This is clearly indicated to us in the book of Luke chap. 2 ver. 21-24, as Mary applies this very observance as is required of every Jewish woman who conceives her first born son. Read Leviticus 12 is first, understand what is being said, then read Luke 2:21-24. Once reading and understanding what is being said, it is clear that the offering Mary offers makes according to ... law of the Lord, A pair of turtledoves, or two young pigeons. [Lk.2:24], ... the one for the burnt offering, and the other for a sin offering: ... [Lev. 12:8]. The sin offering Mary gives is sufficient evidence Mary's carnality. Other proof of Mary being a sinner is found when Mary declares the need of a savior. One is only in need of a saviour when realizing they are helpless and hopeless; that God in Christ having paid the penalty for the sins of mankind, is the One in Whom we are able to find redemption. [Col.1:12-14]. Mary also said, "My soul doth magnify the Lord, And my spirit hath rejoiced in God my Savior" [Luke 1:46,47]. Again, Mary admits her estate as the handmaiden of God and not "Mother of God". Admitting her estate as a handmaiden because God used her instrumentally as a vessel to conceive the Lord Jesus Christ. By Mary s own words, she removes any idea of pre-emanance so as not to assume exaltation above God s calling upon her life. "For he hath regarded the low estate of his handmaiden: for, behold, from henceforth all generations shall call me blessed" [Luke 1:48]. The Scriptures categorically state the family Jesus had, and that Mary did conceive after the birth of Jesus. She never remained a virgin, and can never be considered "immaculate" as the Roman Catholic Church has exalted her to be. "Is not this the carpenter's son? is not his mother called Mary? and his brethren, James, and Joses, and Simon, and Judas? And his sisters, are they not all with us? Whence then hath this man all these things?" (Mat 13:55,56). Mary as mediatrix is unfounded in Scripture. Scripture tells us who makes intercession for the saints before the Father. - The Lord Jesus Christ. Tony you might enjoy, "Behold Your Mother" by Tim Staples. Enjoy, God bless, Merry Christmas. "Scripture is infallible". Really? According to whom? "Scripture is infallible". Really? According to whom? And in what sense? Ah... right... the original reformers were infallible, right? Do not say anything against what they said. Dear David, the doctrines of the Immaculate Conception and the Queen of Heaven are biblical. It's very easy to find these on any Catholic sites. Read the book of Revelation, where our Blessed mother is indeed the Arch of the New Covenant, revealed in heaven. You will also find references of these in several books of the Old Testament. These traditions go back to the early Church before Islam. you are very wrong claiming that there is no biblical evidence. there is ample. Just google. But you are just a typical protestant (though earnest)saying the bible is infallible, but leaving out passages you do not like, and interpreting verses in prideful manner by your own light. Why then I'd like to know are there 3-4000 protestant denominations out there? I am putting it to you, if you would be serious about the truth and would seek it in humility, you will end up a Catholic. Dr. Sungenis will crush him. Sola scriptura is not biblical. The Church is the bulwark and foundation of truth!!! With the exception of the holy Virgin Mary, in whose case, out of respect for the Lord, I do not wish there to be any further question as far as sin is concerned, since how can we know what great abundance of grace was conferred on her to conquer sin in every way, seeing that she merited to conceive and bear him who certainly had no sin at all? The sinlessness of Mary was widely believed, and stolen likely from Christians. She needed a Saviour, and was saved by Grace from sinning prior to sin rather than after. All goodness comes from God and that includes virtue. Mary was extremely humble and realize that God, her Saviour, had blessed her with all of her graces. Your either/or fallacy is a low blow, and it is indeed supported by Scripture. The tabernacle was made with unblemished material, and likewise the blessed mother of God too was unblemished. All one needs to know to know the great grace bestowed upon her is to know that Jesus was born to her. No other creature could come close to the majesty bestowed upon her than this: that God, the Son, our Lord would come and be born of the virgin!